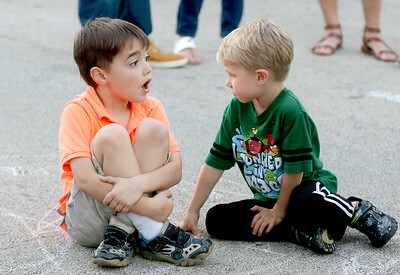 Sarah Nader- snader@shawmedia.com Jackson Ramsey (left), 6, of Cary and Danny Stirlen, 5, of Cary listen the music while attending Saturday's Cary Main Street Fest in downtown Cary September 19, 2015. The outdoor fall festival continues through Sunday an features local restaurants and businesses, a marketplace of vendors and artists, live entertainment and a children’s area. Proceeds benefit Cary Grove Area Chamber initiatives, annual community programming, beautification efforts, the Volunteer Grant Program and sponsorships throughout the year. 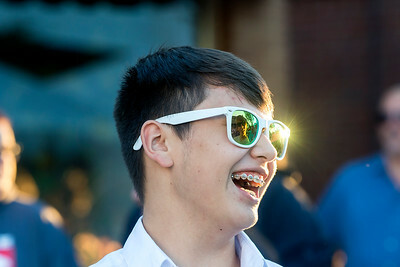 Sarah Nader- snader@shawmedia.com Nicky Covarrubias, 17, of Cary listens to the band while attending Saturday's Cary Main Street Fest in downtown Cary September 19, 2015. The outdoor fall festival continues through Sunday an features local restaurants and businesses, a marketplace of vendors and artists, live entertainment and a children’s area. Proceeds benefit Cary Grove Area Chamber initiatives, annual community programming, beautification efforts, the Volunteer Grant Program and sponsorships throughout the year. Nicky Covarrubias, 17, of Cary listens to the band while attending Saturday's Cary Main Street Fest in downtown Cary September 19, 2015. The outdoor fall festival continues through Sunday an features local restaurants and businesses, a marketplace of vendors and artists, live entertainment and a children’s area. Proceeds benefit Cary Grove Area Chamber initiatives, annual community programming, beautification efforts, the Volunteer Grant Program and sponsorships throughout the year.